Zoom is a common name in the Video Conferencing world. But how can it be used in conference rooms? What should you consider as you plan to leverage Zoom across your organization? The video conferencing environment is rapidly evolving with greater emphasis being placed on easy-to-use conference room solutions. We’re often asked about Zoom, a widely adopted cloud-based video conferencing platform. While some leverage Zoom in conference rooms through Bring Your Own Device (BYOD), many organizations are scaling Zoom with professional endpoints for conference rooms, huddle rooms and meeting rooms. 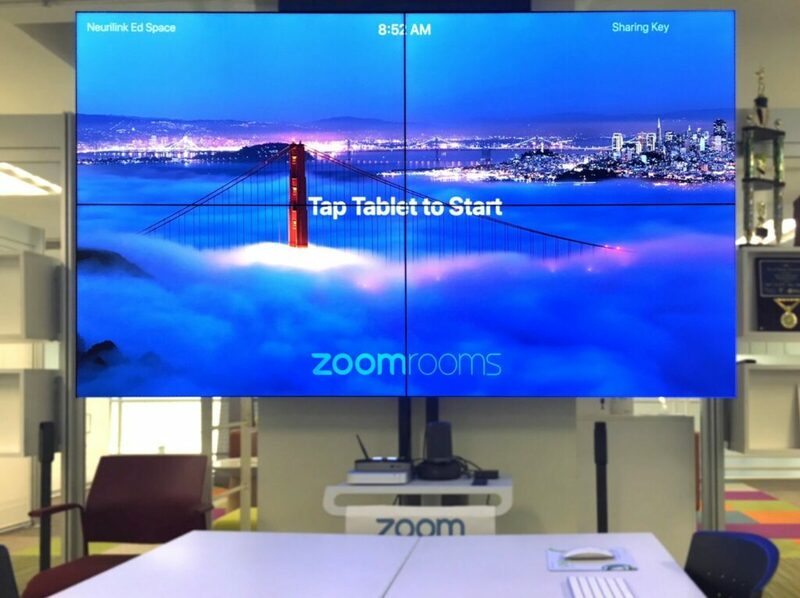 If you’re considering Zoom as a company-wide solution, you may have questions as to how it can be scaled to a conference room beyond a personal laptop or iPad. Here are answers to common questions from those considering leveraging Zoom in their conference rooms. What conference systems are compatible with Zoom? There are two sides to the term compatibility in this scenario. First is interoperability with other video conferencing systems. The vast majority of conferencing system (like Skype for Business or LifeSize) are compatible with dialing into or receiving a Zoom call. Endpoints, the hardware that scales video calls for conference rooms, are a different story. Various endpoints are compatible with Zoom, but the levels of compatibility differ. Some enable Zoom calling, while others natively integrate offering the same look, feel and functionality you expect from Zoom. Polycom and Crestron are examples of hardware platforms that offer a native Zoom experience. Zoom’s interoperability with these systems allows for remarkable ease-of-use. For example, if you send a Zoom invite to an endpoint, you can walk into the conference room and see a green button click-to-join capability. Zoom has the capacity to take invites from third-party systems and showcase them in the Zoom environment with the simplicity of a click-to-join calendar. A well-designed Zoom conference room can feature a similar, easy-to-use, easy-to-schedule interface. For example, the Zoom Rooms scheduling display is configured as a device associated with the room. You invite the room to the meeting through your Outlook, and when you enter the room you simply click the calendar and join. Wireless screen sharing and content sharing is at your fingertips. Yes, the BYOD model certainly applies to Zoom. Users can subscribe to the software, hook it up to USB peripherals like cameras and microphones, and have a group gather around it. When we help companies scale Zoom for a conference room, we often do it by leveraging control panels that feature the same interface as Zoom on a desktop, but do not carry the risk associated with running a meeting from a personal device. For example, a BYOD device can lose battery charge during the meeting, turn off, or run a different application over top of the Zoom interface. Even though you only need Video Conference Codec and a Cloud Connector account to connect with Zoom web conferencing, a few key USB peripherals are needed for group use. In this first use case, you might bring your own device to a meeting with six people and discover that the webcam on your laptop is insufficient. By simply plugging in a USB connection you can integrate a high-quality pan-tilt-zoom camera already in the room. The USB can also connect you to the microphone in the table that will pick up a group of six better than the tiny microphone on your laptop. This can be a great solution for small companies that don’t have the same requirements for robust video conferencing that a large organization may. 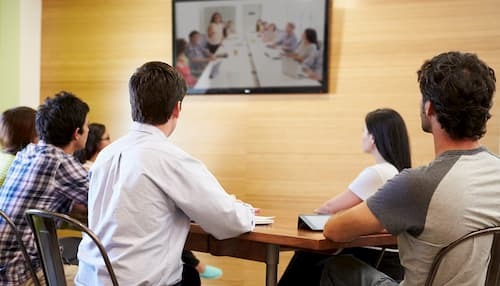 If you have a single, small meeting room occasionally used for video conferencing, a BYOD approach with supplementing hardware could be appropriate. We have trusted manufacturing partners that provide USB microphones, cameras and speakers if this is the right path for you. Imagine you’re a business executive. You’re walking into a conference room for an Executive Review and bring in your laptop to take notes and share information—not drive the meeting. In this use case, a meeting room that has hardware custom integrated for Zoom is ideal. The meeting has been calendared and all you must do is walk in, knowing that Zoom has already been integrated with the advanced technology in the room- from control panel to ceiling microphones and speakers. You press the green click-to-join button on your conference room’s touch screen, everything automatically configures and turns on, and you are free to leverage your laptop for your own needs—like taking notes and reviewing files. If you want to share information or content, it’s at your fingertips, but without the entire meeting running off your personal device. 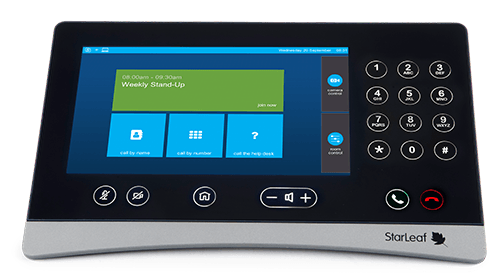 A dedicated user interface in the conference room allows for much greater control of the kind of variables that can make or break a meeting. If you choose the Zoom interface on a control panel, you’ll still be connecting to an endpoint to run the call. It can be a personal device, PC or Mac that’s dedicated to the room, or more traditional endpoint. Clients often choose a dedicated “Zoom PC” with a control panel. We also see a lot of interest in utilizing a Polycom Trio as both the control interface and the endpoint. You can share wirelessly through Zoom or with a wired connection when there is a dedicated endpoint like a PC/MAC or traditional hardware codec. In general, we try to provide both options to clients. However, with wireless sharing’s increasing reliability it is becoming more popular. You may be leaning towards BYOD with USB peripherals, or you may think dedicated hardware is a better path for you. BYOD will require more end-user tech experience and can often result in more user confusion. PC updates, changes in settings, and low batteries can delay video conferencing meetings and create frustration for end-users. However, this approach can often be an economical route for video conferencing. Dedicated endpoints are the preferred option for many of our business clients, because of the consistent experience it offers end-users. As an employee walks into a meeting, they can be confident that there won’t be a surprise update when they try to dial into a meeting. This path is preferred for those that prioritize reliability and ease-of-use. It does typically come at a higher price point than a BYOD system. However, the advanced technologies and reliability are worth the investment for many businesses. The best conference room solutions are tailored to your company’s unique needs, even if the system is developed around a platform like Zoom. We help companies design their conference room systems around platforms like Zoom, expertly tailoring them to the space to offer the best communication experience possible. Please don’t hesitate to reach out to us for answers to your specific use case. We're a Zoom Certified Integration Partner & Reseller. See how we can help you scale Zoom in your workplace. Or learn about how we helped Delta Dental of Washington leverage Zoom.